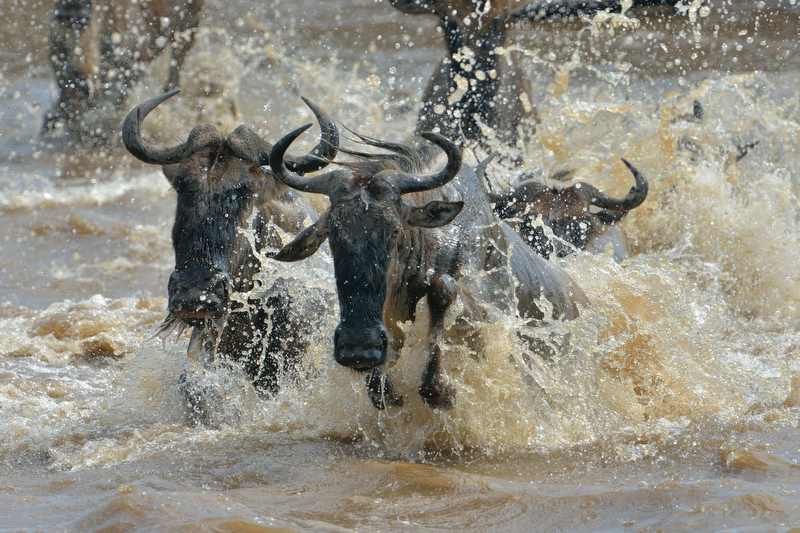 The migration of more than 1.5 million animals from the Serengeti in Tanzania into Kenya by way of the Maasai Mara is hailed as one of the greatest animal migrations on the planet and for any nature and photography lover is a must on their bucket lists. 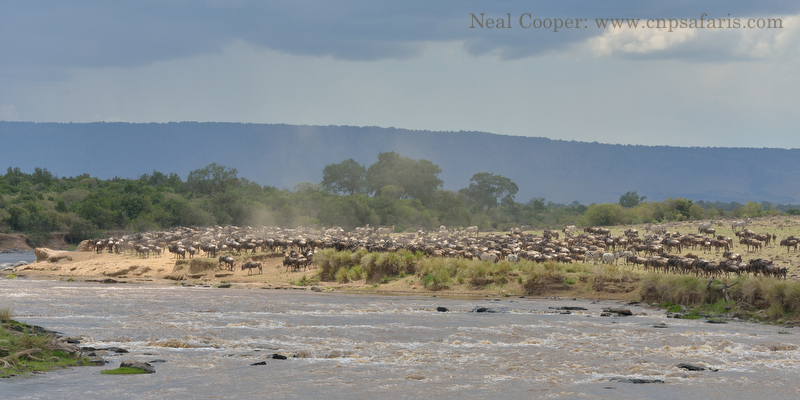 On this massive migration the herds follow the rain and the new grass for grazing. 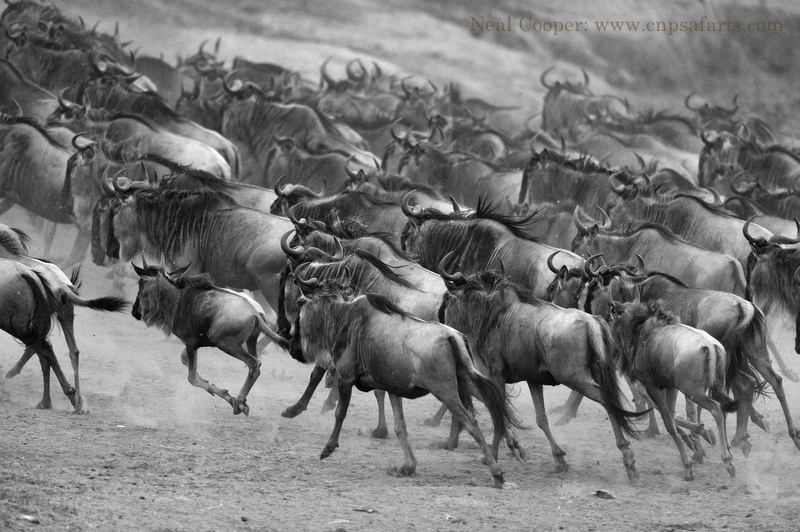 These mega herds are made up of mostly Wildebeest, with smaller numbers of Zebra, Topi and Thompsons Gazelles. 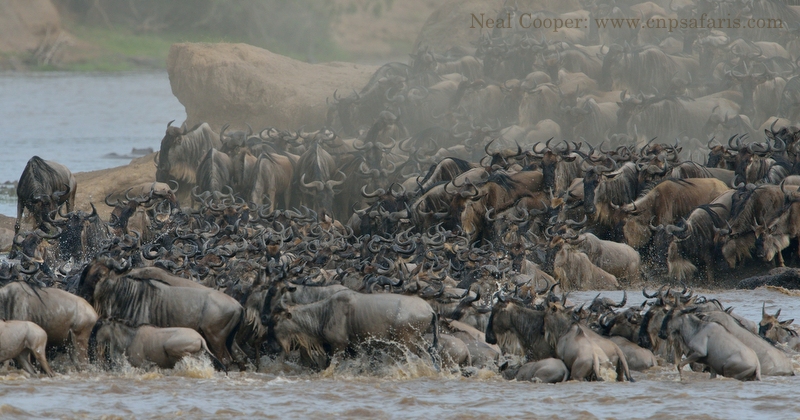 This epic annual journey leads them on a path where they are forced to cross a number of rivers in order to get to the new grass that fuels these mega herds. These rivers could be virtually dry like the Sand River crossing we witnessed or down sheer slopes as with Lookout and Fig Tree crossings. Two of the other crossing point where we spent a lot of time waiting on the crossings were the Kaburu and Mawe Mawe points. 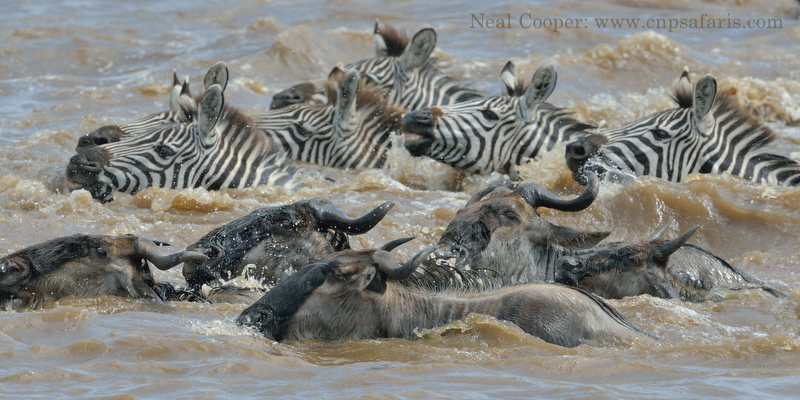 As I said earlier, every visitor to the Mara wants to witness the drama of a crossing. So how does this crossing develop? There are a number of scenarios; the first being that as you arrive at one of the crossing points, you see the dust cloud of running animals approach and they jump into the river without any hesitation and cross to the other side. The second being that the animals arrive at the crossing points in a continuous stream of animals where they the start to build on the river bank. As time goes by more and more animals start to gather, making for a spectacle of sight and sound. There will be numerous attempts by different individuals to cross as they walk down to the river’s edge and then turn around and walk back up the bank. All the animals are waiting for one individual to have the courage to jump into the river and swim out towards the opposite bank. Once the first one goes the crossing is on and they will jump into the river in their hundreds or thousands depending on the size of the herd. This scenario could be played out over many hours of moving to the river and then moving off again. The irony is that the first animals to jump in are generally safe as the crocs and other predators wait for the weaker animals to cross. The last scenario is the one where you have sat and waited for many hours for the immanent crossing when the herd turns and walks back into the grass plains to try again tomorrow or to move down river to another crossing site. 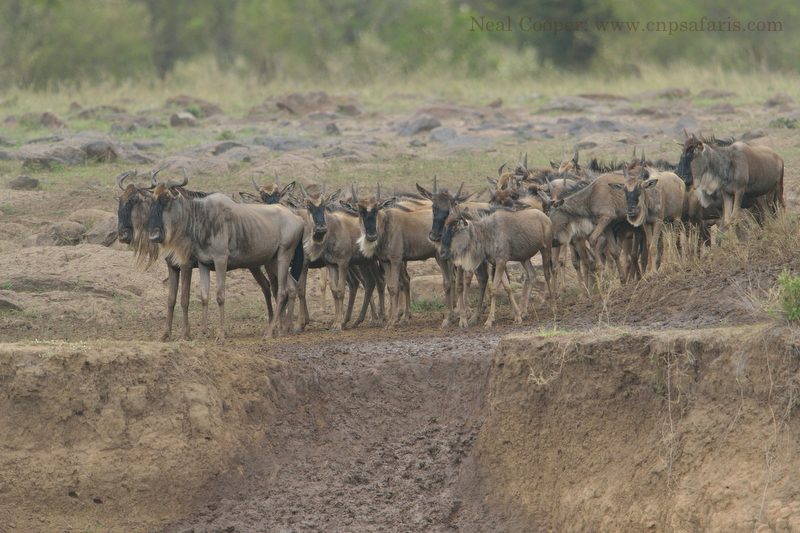 In our experience at a number of these crossings, the one that starts the crossing was a young Wildebeest of less than a year who just wants to get to the other side to re-unite with its mother. These crossings are a very traumatic event in that the animals could have to cross strong flowing rivers, where they face death through drowning, breaking legs on the rocks under the surface or where they exit or by being taken by a crocodile. Even when they do make it to the other side there could be Lions or Hyenas waiting to pick off the weak and tired animals. After such a crossing you will see small herds of orphans and adult with lost young form on the banks calling out to re-unite with their family members. At this point they could just jump back into the river and swim across again. The Zebras are the most orderly but also the most vocal during and after such a crossing as they try and relocate the members of their respective herds. The crocodiles we witnessed at the various crossing points along the Mara are huge individuals with some of the crocs reaching lengths of 5 to 6 meters. A crocodile that size takes what he wants during a crossing. They would swim towards the line of crossing animals and grab one of the younger animals and then drown the unfortunate animal. 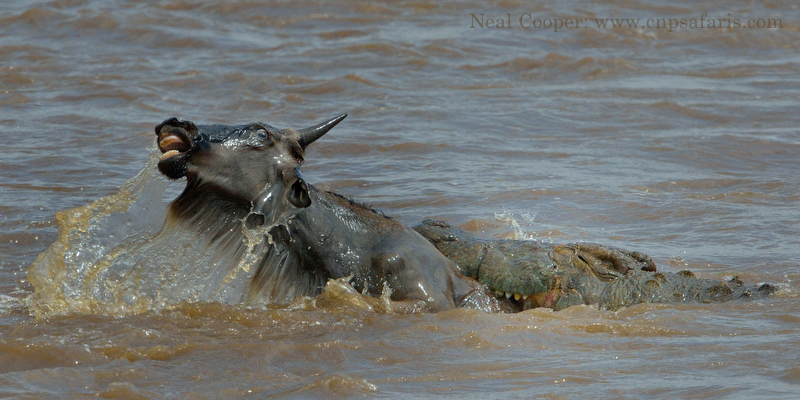 After the had drowned the prey the crocodile would then swim back towards the line of crossing animals and take the next one. They do not start feeding immediately but would push the prey towards the shallows to feed later. It is very difficult to describe to someone the sights and sounds of such a dramatic event such as crossing. There is a lot of dust as they run towards the river, the calls of the various species of animals crossing fills the air, the sound of the animals crashing through the water and the odd cheer from the spectators as an animal escapes the deathly attentions of the crocs. From a photography point of view there are various areas to focus on, like the animals building on the opposite bank, the animals entering the river, the various species as the swim across the river, keeping and eye on the crocodiles as the target specific animals, the animals exciting the river and of course afterwards the plight of the orphaned and separated animals. It is dramatic and emotional draining. We were fortunate to see 5 crossings in one which was absolutely incredible. I can’t wait for next year. Come and join me on a CNP Photo Safari.